Inspired by Rand Paul’s recent theorizing about the Civil Rights Act, I am now going to engage in some thought experiments regarding Sneetches and their beaches. As we all know, there are two basic kinds of Sneetches: the first have on their bellies stars; the second have none upon thar’s. Among these Sneetches, there are two psychologies: the separatist Sneetches, and the accommodating Sneetches. So, in the land of the Sneetches, there are two private beaches. The separatist Sneetches, when given the choice, will not go to the beaches that feature the opposite-bellied Sneetches; the accommodating Sneetches, when given the chance, will go to whichever beaches are most easily reached. Assume, for the sake of argument, that there is a population of Sneetches, both star-bellied and not, who can easily reach each private beach. Of regular beach-going Sneetches, eighty percent have bellies with stars, and twenty percent have none upon thar’s. Sylvester McMonkey McBean owns one of the two private beaches. Assume first that, at present, the two private beaches are available only to star-bellied Sneetches. And assume, likewise, that all Sneetches with no stars on their bellies are accommodating — so, while some star-bellied Sneetches will never go to the beaches where there are Sneetches with no stars, the Sneetches without stars will go to whichever beach is most easily reached, regardless of the stars or the lack thereof on the belly of each beach-going Sneetch. Assuming that accommodating Sneetches, when given the choice, would prefer a less-crowded beach, what percent of star-bellied Sneetches must be accommodating in order to make it profitable for Sylvester McMonkey McBean to let Sneetches without stars on their bellies onto his beach? So, remember, the second he opens up his beach, all of the separatist Sneetches will go to the other beach — HOWEVER, all of the accommodating Sneetches, preferring a less-crowded beach, and not minding that they’d share it with plain-bellied Sneetches, will go on to Sylvester McMonkey McBean’s. The answer to this, I believe, is one Sneetch more than 25% of the star-bellied Sneetches. Precisely 25% means the beach is as profitable accommodating as separatist; one Sneetch less than 25% means Sylvester McMonkey McBean would lose money by making his beach accommodating. This assumes that there are no violent, anti-plain-belly Sneetches with stars on their bellies, ready to dump medical waste on Sylverster’s beach out of spite; if that were the case…well, let’s see. Sylvester is currently getting roughly 40% of the beach-going population. It’s fairly safe to assume that the accommodating star-bellied Sneetches would prefer a crowded beach to a poisonous one, and it’s probably safe to assume that no more than half of any individual population is going to want to go to a beach where there are used needles everywhere, then it wouldn’t be profitable for Sylvester McMonkey McBean to open his beaches to all of the Sneetches unless all of the Sneetches were plain-bellied Sneetches, which obviate the issue in the first place. Incidentally, of course, this will also depend on what time everyone gets up. If the plain-bellied Sneetches get up first, and the accommodating Sneetches get up second, then Sylvester McMonkey McBean will still lose money at his private Sneetch beach, since the accommodating Sneetches will eschew the accommodating beach in favor of the emptier separatist beach, and when the separatists finally get up, the beach will be too crowded for them, and they might just stay home. Now, let’s say that there’s a third profile for star-bellied Sneetches: the isolationists. 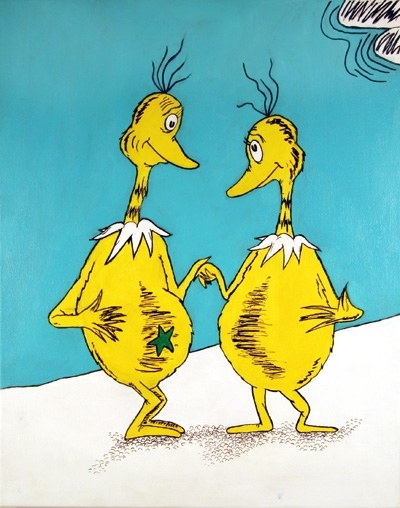 The separatists, when given the choice, will prefer a beach with only Star-Bellied Sneetches, but maybe they’d rather share than not go to the beach at all. But the isolationists will stay home rather than share a beach with a plain bellied Sneetch. Now: let’s assume, for the sake of argument, that precisely 25% of star-bellied Sneetches are accommodating, meaning it’s exactly as profitable for Sylvester McMonkey McBean to open his beaches to plain-bellied Sneetches as it is to keep them closed. But the town is about to take a vote! If the vote passes, they will make a law that says that no beaches can prohibit any Sneetches, star-bellied or not. Based on the numbers that we’ve got, if you had all plain-bellied Sneetches, and all the accommodating star-bellied Sneetches voted FOR it, and all the isolationist and separatist Sneetches vote AGAINST it, the vote will fail. So, let’s say there are a couple more accommodating Sneetches who’ll vote for it, despite the fact that they don’t really go to the beach, bringing the numbers up to a tie. We know, from reading the histories of that eminent historian Theodore Geisel, that Sylvester McMonkey McBean is the sort of man that doesn’t care about anything but making money, so he’s faced with an interesting quandary: how should he vote? Now, the other beach owner might vote for or against, or he might stay home, so Sylvester needs to pick one. He thinks about this for a second. Because, see, if BOTH beaches are made available to all sorts of Sneetches, then both beaches will make more money, because the separatist Sneetches will still go to the beaches, since they’ve no option for a beach where there’s nary a plain-bellied Sneetch. The question is, how many star-bellied Sneetches will just stay at home, rather than share the beach with with a plain-bellied Sneetch? If the answer is 20% of beach-going Sneetches, or one-quarter of the total of star-bellied Sneetches, then as many isolationist Sneetches will stay home as there are plain-bellied Sneetches who’d start going to the beaches, meaning that both beaches would make just as much money. But! If there was one less than that — and the odd extra Sneetch took turns (since both beaches are equally accessible, it’s just as likely every day that he’d choose one over the other), then both beaches would make more money after the law than before. Sylvester McMonkey McBean should probably take a poll. Interestingly, you’ll notice that this looks a little like the prisoner’s dilemma: if neither beach trusts a plain-bellied Sneetch, then both beaches make less money. If both beaches trust, then they will both make slightly more. If one beach trusts and one doesn’t, they both will make more money — but one will only make slightly more, while one makes substantially more than the other. There are a couple other things that make the issue interesting complicated. For instance, what if there are three beaches? In that case, it’d be profitable to open your beach to plain-bellied Sneetches, but only as long as BOTH of the other beaches remain separatist; if one beach become separatist, and two of the other beaches are accommodating, then the separatist beach gets all the separatist business (60% of beach-going Sneetches), while the other two have to split the remaining 40% between them. Now, consider what happens if there is also a class distinction: that is, plain bellied Sneetches just don’t make as much money as star-bellied Sneetches. In a three beach market, the star-bellied Sneetches are happy and willing to pay $10 a day to go to their beaches — but if you wanted to open your beach to plain-bellied Sneetches, you couldn’t charge more than $7. What this means is that, even if you got all of the accommodating Sneetches (which you would, because it’s a cheaper beach) and all of the plain-bellied Sneetches, you’d still lose money, both compared to what you were making before AND compared to your two competitors. That’s assuming, of course, that separatist star-bellies would be willing to pay an extra three bucks to not have to see a plain-bellied Sneetch on their star bellied beach; if you figure, though, that some of them would actually just prefer a cheaper beach, then what happens? Sylvester opens his beach up and cuts his rates — which means the other two beaches have to cut their rates to keep up with the business; now, Sylvester McMonkey McBean is making more money, because everyone’s charging less and he’s got a higher percentage of the population. So what do the other two guys do? They are stuck in the same dilemma that we saw before: as long as they BOTH open their beaches up, then everyone’s making slightly more money than they were making before; but if only ONE of them does it, then he and Sylvester start losing money, while the third guy makes a fortune catering to separatist Sneetches. Nevermind the fact that, in order for Sylvester and his fellow beach owners to make a profit while charging $7 for a day at the beach, they wouldn’t be able to afford to do as much maintenance, leaving the beaches grubby and ugly, and thus reinforcing the idea among star-bellied Sneetches that their plain-bellied cousins are filthy and horrible. This, of course, would decrease the number of accommodating Sneetches, and thus make it less and less likely that anyone is going to open their beaches up to the plain-bellied Sneetches any time soon. 1) Social justice isn’t inherently profitable. There are plenty of scenarios in which you can make more money by being a racist douchebag. I guess this explains why segregation was a common business practice in the south for a hundred years. 2) Sometimes, government meddling actually permits business to make MORE money: if the government forces all beaches to be accommodating, then no individual beach has to worry about his competitor getting a leg up by catering to the separatists. Ow! My head says both Sylvester McMonkey McBean and many Senate Republicans are opportunistic Charlatans, but when such bottom-feeders have too much detritus (the potential money to be made from hoarding and prejudice, an astonishingly broken-down economy, now in the hands of a Democrat president) to choose from, what to feed-on first? In retrospect, this might have been easier to read if I hadn’t been so committed to rhyming.